Liisa Turunen is returning to teach for us October 15th and 16th! 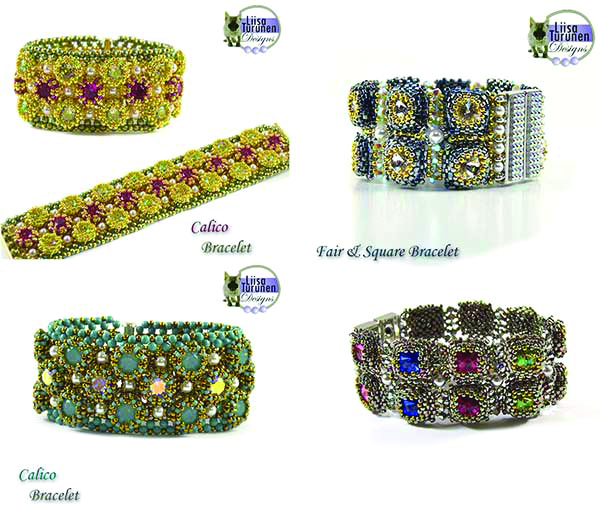 Liisa taught for us last year at Bedecked and Beadazzled and we all had a fabulous time. Her beadwork is blingy and fun! She is a delight and so very patient! She can even see from across the room when we make a mistake. Oh to have young eyes! We hope you will consider joining us for one or both days. On October 15th from 11-6pm she will be teaching the Fiona Lariat. 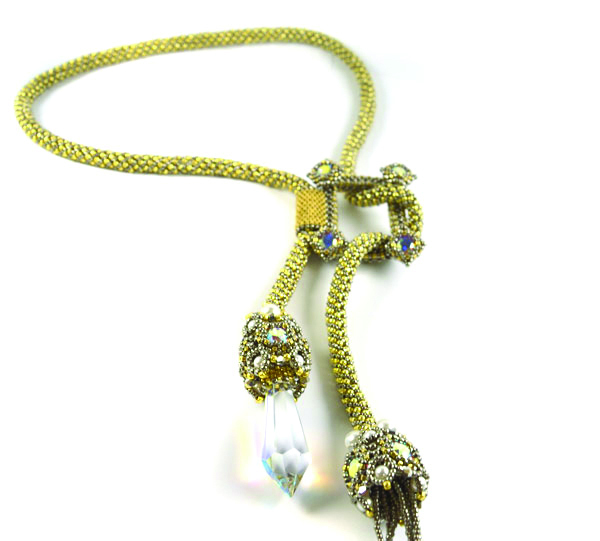 It is a sparkling delight with it’s netted chain and two different finishes on either end! Class cost is $275 and includes the complete kit and lunch. Color choices are Silver & Gold, Bronze & Rosewater or Pacific Opal and Bronze. On October 16th from 11-6 pm we will be hosting the Bracelet Bonanza! Create one or both of these bracelets. It’s hard to choose! Class cost is $275 and includes one complete kit and lunch. Color choices for Calico are Jade & Bronze, Gold/Fuchsia/Green or Bronze & Yellow. For Fair & Square choose between Clear/Blue, Nickel with Multi Color or Green & Gold. Kits will be available so that you can also purchase a second kit, no class fee for the second kit! A $150 deposit/class is required to hold your spot.